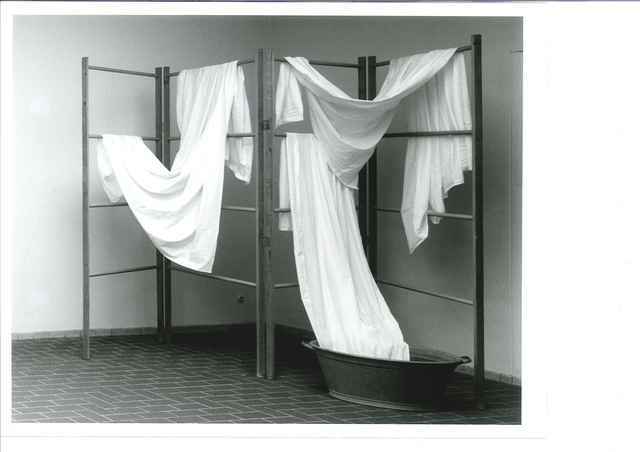 Drying Rack (1968) is an installation that arouses a feeling of timelessness and endlessness which is very comparable with the monotonous hum of the fans and the endless rustling of the curtains in the installation of the Oude Kerk. Between the four footed wooden drying rack stands a zinc washtub filled with a warm soap bath. A sheet that hangs over the rack, trails into the water. On one side it soaks up the water, on the other side the water slowly drips back into the washtub, which creates a sort of perpetuum mobile. The sounds of the dripping water, the steam coming from the warm water in the tub and the smell of soap transform the space where the work is installed. Drying Rack was last installed in 1969 at the Kunsthalle in Bern and will now be on show again, exclusively during Amsterdam Art Weekend at Upstream Gallery. From 24 November 2016 to 26 March of 2017, a new site-specific artwork by Marinus Boezem (The Netherlands, 1934) will be presented in the Oude Kerk. In this church, the oldest building in Amsterdam, he creates a vertical labyrinth in which you disappear and reappear. Boezem approaches the idea of the building as a vehicle or conveyor that lifts the individual from his earthly existence – sometimes literally, using the principle of the force of gravity. The crux of this exhibition is Boezem’s new work: a lift transports you to the top of the church up to the highest church window – like a deus ex machina. From a dizzying height you can view the monumental church from a whole new perspective. Look closely, and catch a glimpse of the personal message that the artist has left somewhere up on high. Like the work of his digital native peers, Dullaart’s often conceptual work manifests itself both online and offline. Within his practice, he reflects on the broad cultural and social effects of communication and image processing technologies while critically engaging the power structures of mega corporations that dramatically influence our worldview through the internet. 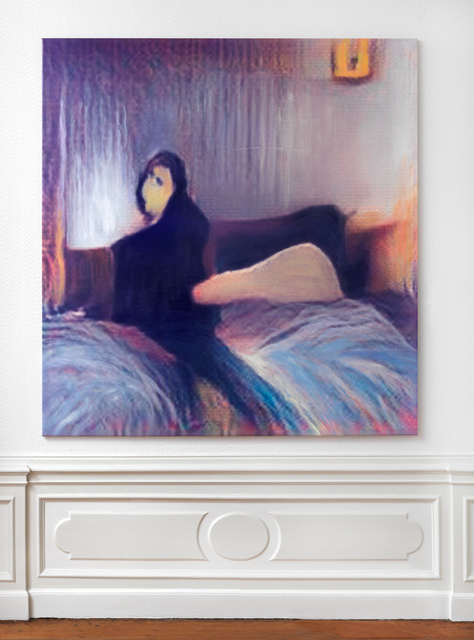 During Deep Epoch, Dullaart shows a new series of oil paintings based on images generated by ‘neural networks’; works derived from his recent performative intervention The Possibility of an Army, as well as photographic prints from his Instragram project for Jeu de Paume and HMKV: High Retention, Slow Delivery. 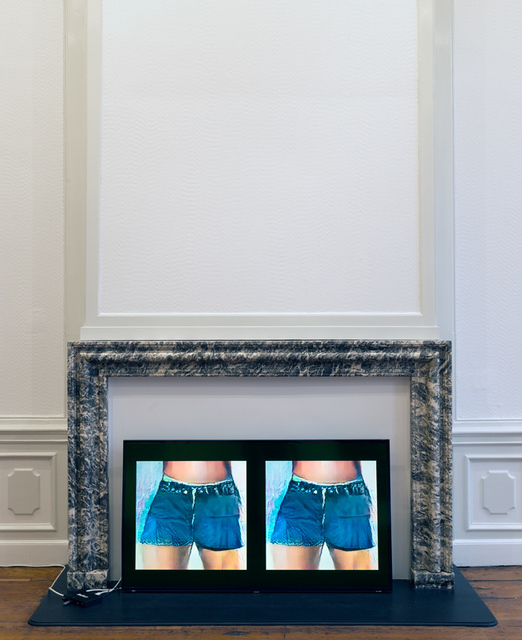 In 2015, Dullaart was awarded the Prix Net Art, the international prize for internet art. Recent exhibitions include Electronic Superhighway, Whitechapel Gallery London; The Possibility of an Army, Kunsthalle Schirn, Frankfurt; Public Works, Hoog-Catharijne, Utrecht (2016); The Censored Internet, Aksioma, Ljubljana; When I Give Myself, I Give Myself, Van Gogh Museum, Amsterdam and Alogorithmic Rubbish, Stedelijk Museum Bureau Amsterdam (2015). Dullaart has curated several exhibitions and lectured at universities and academies throughout Europe, most recently at Werkplaats Typografie, a post-graduate programme at ArtEZ, Arnhem. Machine learned, man made paintings. Synthesised image concepts. Within the current Machine Learning Revolution, so-called convolutional networks (ConvNets) can now recognize objects within photographic images. This might seem like a trivial addition to already existing computer and online service capabilities, but it is a crucial step in how humans can interact with representation and depiction. The enhanced agency differentiating a cow from a horse, is rapidly developing into recognizing specific people and their moods, and interpreting behaviour. If we all collectively imagine a candle, what would come out? Thousands, millions of images of candles are photographed and archived, representing so many aspects of our lives. Dinner conversations, social relationships, health, design, wealth, culture. Reverse engineering the so-called ‘neural networks’ that Facebook and Google use to recognize image content with, shows however what these networks understand of us so far: a cold machine-like interpretation of what we prefer to see and what we depict when representing a restaurant, fire, a refrigerator or a handkerchief. A collective visual consciousness learning to recognize the gradients, saliency, angles, curves and hues of every visual concept we can imagine. It shows what translates of our culture to machine understanding at this moment. Every day, new interpretation skills are outsourced to a neural network and every month shows us new applications of creative labour learned to a machine. Security cameras recording to the cloud are feeding the network to learn what evil is, based on statistics. We are outsourcing judgement and prejudice to facts interpreted by rules. It’s not our decision, it is the network’s decision based on learning from all the facts in the world. In a way these synthesised images, based on photographic representation, show a mechanised version of the collective consciousness of Western societies. These current state-of-the-art, synthesised images look quite painterly, very surreal, copying human sense of documentation, and composition, rendering each visualised class a deadly but sympathetic rendering of the gestalt of the class in question. This mechanical depiction of a concept questions our understanding of depiction in general, especially when positioned within a timeframe of rapid development of these convolutional networks. The sheer amount of money, education, talent and computing power Facebook, Google, OpenAI and others are throwing at these developments, does not suggest anything else then a future in which these techniques will be utilised and rapidly developed beyond the current painterly, even beautifully naive level. Selected to show the trivial banal technicalities of human life, and the Convolutional Networks vision of its own parts, Dullaart sent the slightly naive, yet cold and surreal depictions to paint factories in Dafen Village, Shenzhen, China and translated into oil paintings on canvas. Continuing the image automation process with outsourced human labour. 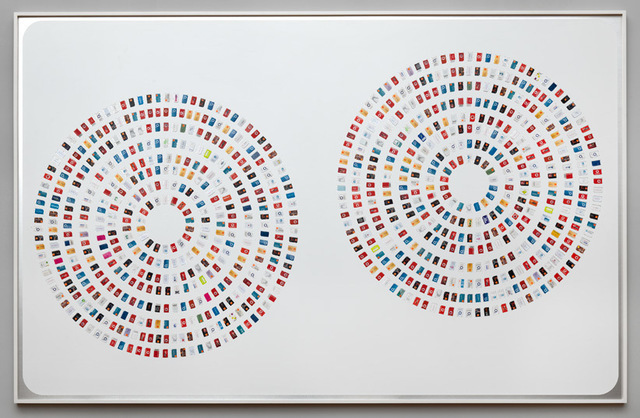 The TNT express delivered canvases were treated with an automotive clear coat mixed with ghost pearls, normally used in car paint and product design, amplifying the mechanically attractive, adversarially authentic compositions. In Dullaart’s recent durational performance The Possibility of an Army at Schirn Kunsthalle, he critically explored the concept of digital identity, which has strongly gained in importance through the daily use of social networks. Dullaart created a ‘fake’ army to stand up in the war against the current American social media revolution the false validation systems in journalism based on follower counts. The army was assembled of thousands of artificial profiles on Facebook, for which the artist used the names of the original Hessian mercenaries who were hired by the British to fight in the American Revolutionary Wars (1775–1783). The original army generated a new income to Landgraf Friedrich II of Hessen, which he used to build the first publicly accessible art museum in the world: the Fridericianum. The fake profiles’ accounts were registered on phone numbers bought in bulk in multiple countries. The accompanying SIM cards are by-products of companies offering PVAs (Phone Verified Accounts) as a service to create multiple user accounts, acting as passports to new identities. As a physical extension of this project, the artist has created compositions out of the purchased SIM cards. Waging a war against Facebook through the channels of mass media , the SIM cards also act as the only physical remnants of the soldiers, as Facebook has now deleted 90% after Dullaart released the historic source of the Hessian soldiers names. Purchased by kilo, the SIM cards are often recycled for their gold recovery, a process seen as contemporary or urban mining. The works therefore stand as a placeholder for the inherent value of identity as a commodity, turned to profit by having the new identity click, like, retweet and follow. Leaving a thin sliver of gold worth a few cents when recovered. These frozen choreographies featuring physical remnants of artificial identities represent further standing armies in ongoing and future information wars fought with automated cultural output.